Moles are difficult to control. After vegetable gardening for many years this is my first experience with these pesky little critters. I am learning that moles are a challenge and the one word people use mostly with controlling them is eradicate. 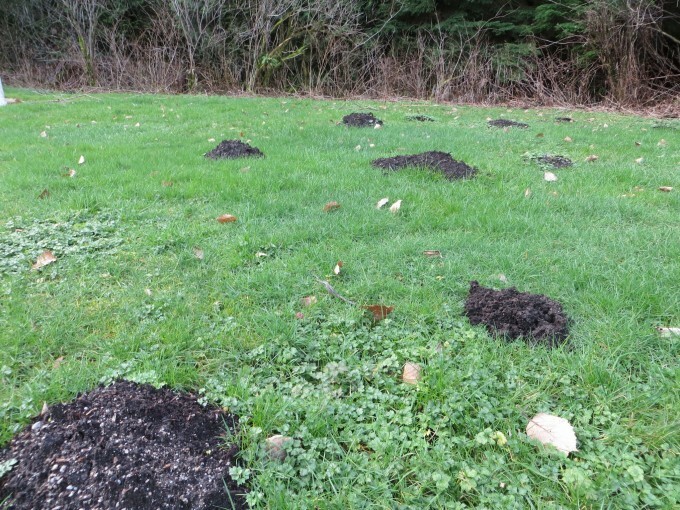 Trying to co-exist with moles can be challenging as they can make a grand mess of a newly mowed lawn and they love tunneling in the greenhouse. The following will explain what I am doing to live and let live, and accept the fact that they were here first. 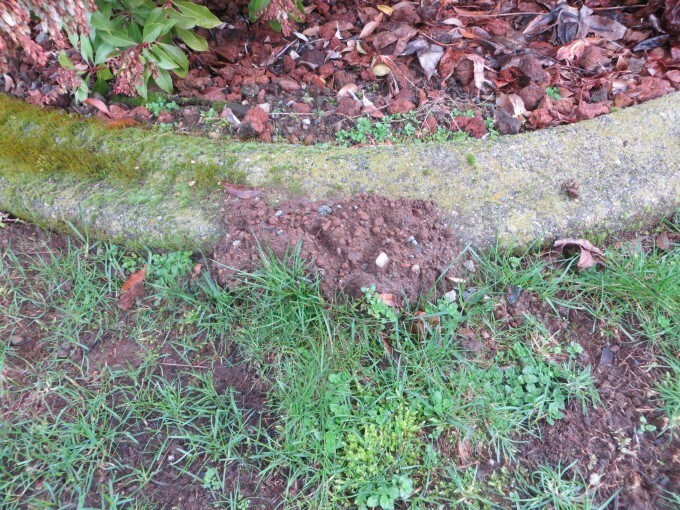 A lot of garden damage attributed to the mole is actually damage from rodents such as mice and squirrels, rabbits and other animals. It is impossible to dig them up as sometimes their tunnels, or especially their nests, can be 3 feet underground. The only permanent way to control moles is to trap (and kill) them. The down side to this is as you keep killing moles, more moles just move in. The pest control companies will visit your home each month, for an annual fee, set traps and come back the following month to remove the dead moles and reset the traps. We did speak to a “mole man” about this method of eradication and he said “it is quick and effective”. Moles are not on anyone’s endangered species list so their removal from thousands of yards is not noticed. Last fall we covered our front lawn with a 1/4 – 1/2 ” layer of relatively fresh crumbly chicken manure. 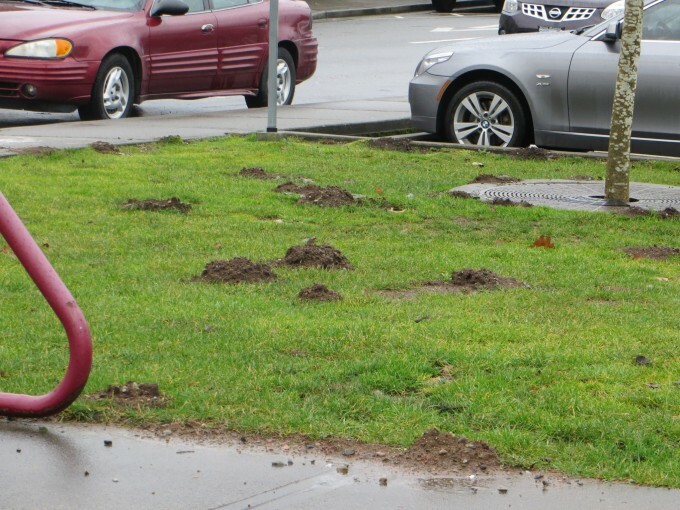 We noticed that in the past 4 – 5 months there have been no new mole earth mounds or tunnels in the front yard. I read recently that putting fresh dog poop down a mole hole will discourage the moles. That I can believe. We no longer have a dog and I frankly would not wish to put their excrement in my vegetable garden. But we do have access to fresh organic chicken poop. So I plan to substitute organic chicken poop for dog poop and see what happens. This is going to be my spring experiment – before all the little baby moles appear in Spring. Evidently serious damage can be caused by moles in commercial corn fields, orchards and flower beds. Whatever you decide if you have a mole problem, do not use poisons of any sort as toxic chemicals are not a good idea to use in your home vegetable garden around children, pets, birds and frogs, and your food. Strong smells such as orange peels and strong-smelling scents when placed inside a mole tunnel may deter moles. Also moles appear to dislike the smell of a plant called caper spurge (Euphorbia lathyrus) so try it in your garden. Dirty cat litter was another suggestion to put down a mole tunnel, but I prefer not to put this in the veggie garden. Plastic toy windmills throughout the garden may deter moles from the noise they make in the wind. Place in ground at regular intervals in your garden. An ultrasound electronic device may also deter moles and other small animals. Writing this article has taught me more about moles and their habits than I would ever have imagined. It is obvious that our vegetable garden is Prime Mole Real Estate. As I have no wish to start a regime of killing moles every month I am hoping to continue to co-exist with these little critters. I mean how much of a problem can 2 moles be? I would like to know if moles eat slugs that might make living with them a lot easier. Update: October 2017 – It may be wishful thinking but mole activity appears to have greatly decreased in the past year since using coffee grounds mulch in the gardens. Cats don’t seem to like it either. A bonus!